Hi friends! I hope all you Canadians had a fabulous Thanksgiving weekend full of delicious food, family, friends, and funtivities. My brother, his GF, a family friend, and I had an orphan’s celebration in Kelowna chock full of delicious and nutritious treats. I created some new recipes that will be making their way to blog in the next few weeks so stay tuned. 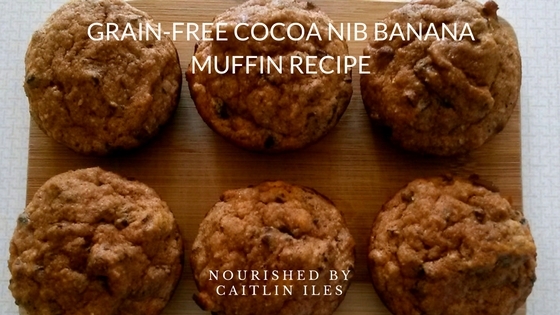 But for today we’re going to focus on a delicious Cocoa Nib Banana Muffin Recipe. Bananas are one of the most versatile fruits and they also happen to be one of my faves. You can use them in smoothies, freeze them to turn into ice cream, make yummy chips, or turn them into delicious baked goods. For baking you want to make sure your bananas are as ripe (read brown/black) and squishy as possible as this will add extra banana-y flavour. These fruits are a fab source of potassium, a mineral needed for maintaining proper fluid balance and blood pressure in the body. They also contain a healthy water-soluble fibre called pectin, which helps balance blood sugar to prevent the peaks and crashes that may cause mood swings, irritability, and, over the long term, inflammation and disease. You’ll also be avoiding the use of grains in these muffins because many people who suffer from digestive and malabsorption issues can be sensitive to the phytates and lectins found in many grain products. Oftentimes one of the major issues with baked goods is that the use of refined flours and sugars used in typical recipes are stripped of the fibre and nutrients needed to send signals to your body that you are satiated. Not only are these foods quickly absorbed, causing spikes in blood sugar, their lack of nutrients do little to fill you up, meaning you’ll keep reaching for the calorically dense, but nutrient poor goodies you’re used to. I work to avoid these kinds of issues in my baking, which is why I try to incorporate coconut flour into many of my treats. It has an incredibly high proportion of fibre, combined with some protein and other nutrients to help satiate your sweets cravings without wreaking havoc on your body. For sweetener you’ll be using one of my all-time favourites: coconut palm sugar. This sweetener is rich in minerals and has a lower glycemic load than your cane sugar alternatives. It also adds a rich, almost caramelly flavour to your baking that compliments the bananas and fall spices. Finally, adding cinnamon, which helps with the cellular uptake of glucose, ensures that these sweet treats, when eaten in moderation, can be part of a healthy and happy diet. Line a muffin tin with parchment cups or grease with coconut oil. In a medium sized mixing bowl combine all dry ingredients except the palm sugar and cocoa nibs. In a separate mixing bowl whip together all wet ingredients until thoroughly combined. Add the palm sugar and continue whipping until the mixture is smooth, creamy, and slightly fluffy. When you think you’ve whipped it enough, keep going for 30 seconds. Once your batter has reached the proper consistency pour in dry ingredients and whip until just combined. Using a spoon fill muffin cups ¾ full. Bake for 15 minutes or until edges are golden brown and the centre springs back after pressing it with your finger. Well that’s my recipe for today friend! They make a delicious snack or yummy breakfast when topped with coconut oil and almond butter. If you’re looking for more yummy and beautifying breakfast ideas then make sure you download my FREE Sensational Smoothies E-Book by clicking here. Have a wonderfully whimsical week!